Find Sanford FL Homes under $200,000 for Sale. View the Sanford Florida MLS for all Real Estate Listings up to $200,000. 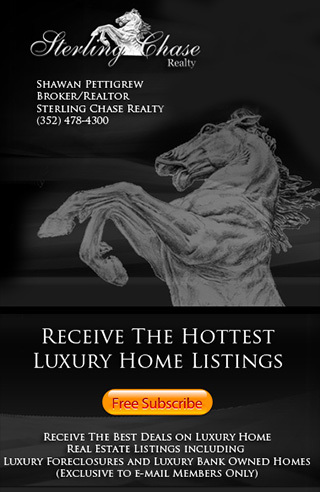 Welcome to Sanford Luxury Homes - The official site for Sanford, Florida Luxury Homes for Sale & Real Estate information. Sanford Luxury Homes Network provides real estate information and resources to guide homeowners and homebuyers through the process of selling and buying a home, house, townhome, condo or other luxury property. Sanford Luxury Homes also contains information on Sanford, FL public schools in Seminole Co, Sanford Foreclosures, nearby shopping, dining & entertainment, Sanford real estate property taxes, Sanford neighborhoods, Sanford mortgage rates , Sanford home loans, vacant lots & land, Sanford community home owners association & more. If you have questions about Sanford Luxury Real Estate or would like to know more about buying a Luxury home in Sanford Florida please call us at (352) 478-4300.